This is the first year that the toddler has really 'got' Christmas. At 2.5 years, mainly through the medium of Peppa Pig's 'Christmas' book, Christmas is more than just eating lots of brightly coloured festive wrapping paper as it was last year (the year before she mostly slept through the big day whilst dressed in various 'My First Christmas' paraphenalia). We've met Santa (twice; surprisingly he turns out to not be that busy this time of year), been required to redecorate the tree on several occasions, reiterated every morning that we only open ONE window on the advent calendar each day and firmly established that all she wants for Christmas is a pair of yellow trousers. We've also been busy in the kitchen. 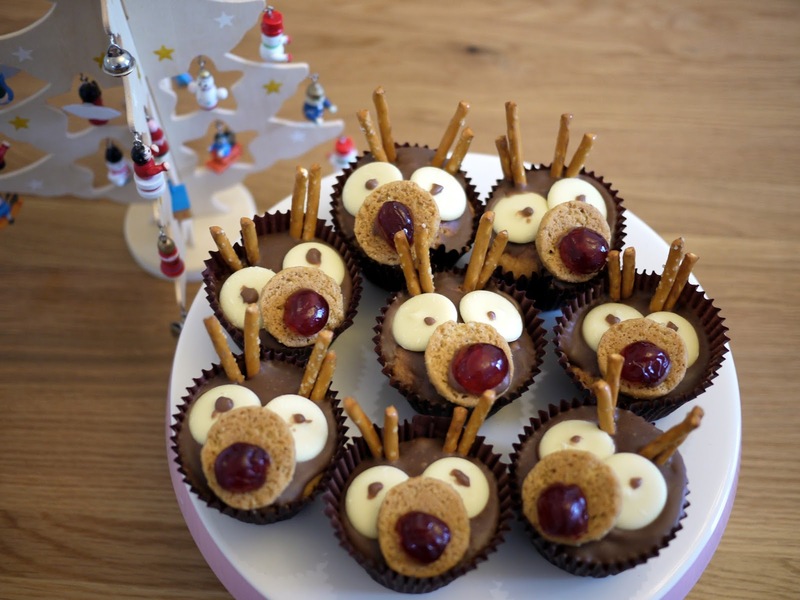 In the toddler's Peppa Pig magazine there was a recipe for Rudolph cupcakes and I was instantly instructed 'MAMA MAKE!'. The toddler took on the role of executive chef, which mainly involved carefully studying my efforts to ensure they exactly replicated those in the magazine. To be honest, at best these look 'rustic', at worse, they look as though I consumed an entire vat of mulled wine before switching the oven on. But hey, to completely misquote the best festive movie of all time (ahem, Love Actually) if you can't bake shoddy Rudolph cupcakes for your daughter at Christmas, when can you? Merry Christmas all you lovely people. 7. After reserving 1 tbsp of icing, gently spoon the chocolate icing over each cupcake and allow to set.